Every now and again it's nice to be a tourist in your own city. Sometimes I take living in London for granted, I'd love to share more of my favourite areas and places in London with you so let me know if this is something you'd like to see, particularly any areas. Notting Hill is a fantastic part of London and is so much more than the film. So here are a few Instagram hot spots for you, and if you want some more, check our Niomi Smart's guide. Thanks to the royal wedding I've recently been to the Notting Hill for work more than ever. All of the international TV channels have been wanting to come down and film which is rather exciting! If you follow any London based bloggers than you would have seen the shop front on my feed quite a few times. The beautiful hand painted illustrations do make for a lovely photo, plus there are loads of tasty biscuits and cakes inside which are also super fab to take a photo of. They also have an icing cafe on the Northcote Road if you're based in South London. 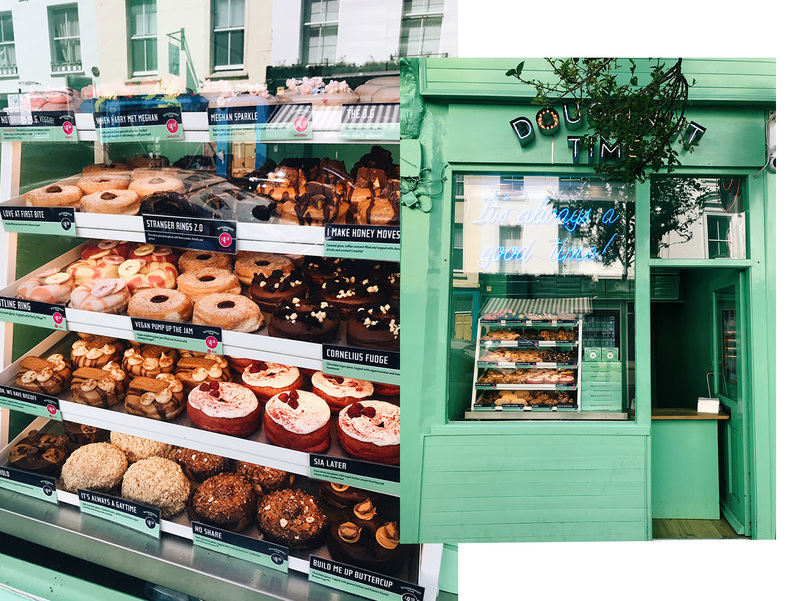 A new addition to Notting Hill, and the UK is Doughnut Time. The brand specialises in doughnuts finished with plenty of unique and delicious flavour combinations. I've tried the part ring and red velvet, both scrumptious and will definitely satisfy a very sweet tooth. Plenty of their doughnuts are vegan and are just as flavoursome, so no-one has to miss out on doughnut time. However they have been known to sell out! A gorgeous shop front and a Mr Grubers shop in the Paddington films, (recognise it now?) Just like Mr Gruber's, Alice's is an antiques shop that has been situated on the portobello road for decades. You can find a few current interior favourites too including kitsch tea pots and vintage style crates. I love the bold colour of shop and it makes the iconic pastel road just that little bit more colourful. Plus it makes for a great instagram shop, it feels very British too! I need to go and check out that doughnut shop!